Ascension Island is an isolated island of volcanic origin in the South Atlantic Ocean, around 1,600 kilometres from the coast of Africa, and 2,250 kilometres from the coast of South America. Ascension island was discovered on Ascension Day 1501 by Portuguese navigator Joao da Nova, which explains why it got its name. It was first occupied by the British in 1815, to ensure that Napoleon did not escape from his exile in nearby (700 miles away!) St. Helena. Its population, currently under 1,200, is outnumbered by sea turtles and sooty terns. It remained under Admiralty rule until 1922, when it was annexed as a dependency of St. Helena. Ascension has issued its own coinage, all commemorative, since 1978, St. Helena since 1973, while St. Helena and Ascension have issued coins in joint names since 1984, including normal circulation coinage. 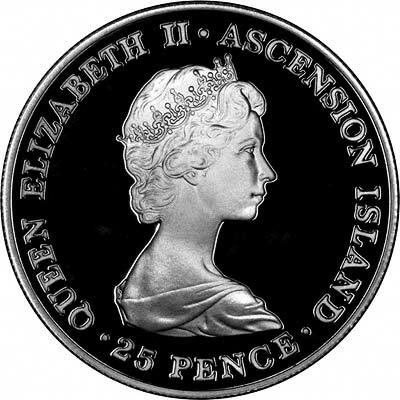 For silver and base metal coins of Ascension Island, please look at our original Chard Coins website. We make an active market in almost all world coins, gold or otherwise, including Ascension Island gold coins. If you have any of these coins to sell, please contact us, or post them to us for appraisal and offer.